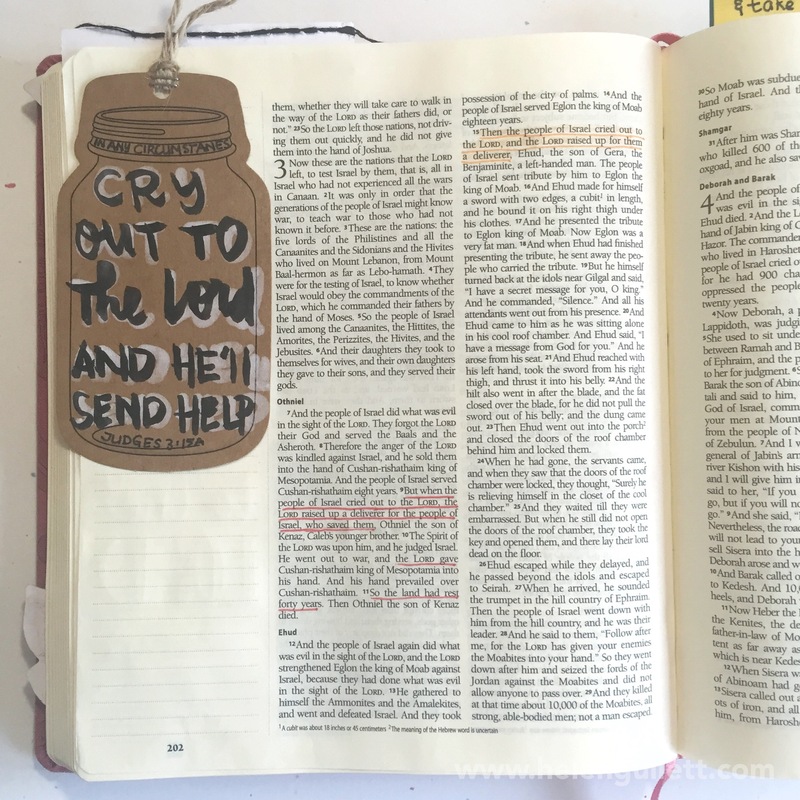 Jesus came not to make us feel better, but to save us from the death. He came to redeem, to restore, to heal and to renew lives. Today’s we start week 3 studying the book of Ruth with HelloMornings group. We read from Ruth 2:1-7. Ruth and Naomi settled in and started a new life in Bethlehem. Both of them are widows. They did not have any men in their lives to provide food on the table, they had to work to survive. As we all know, when we move to a new place, new city, new home, it takes a while to settle in and get used to the new place. But God was there with Naomi and Ruth. God used Boaz – a wealthy, respected and God-loving single man – to bless Ruth and Naomi and to restore their lives. In God’s storyline, there is no such things as coincidence. When I read this verse 4, God spoke to me personally to remind me to always greet others with His blessings. In this world already have too many sadness, discouragements and disappointments. Words we speak can be a blessing and encouragement to others, or can be a curse and discouragement to them. Boaz knew Naomi becuase they were related because he was her husband’s relative. But Ruth, Boaz never met of her nor heard because she was married to Naomi’s son when they were in Moab. When Boaz heard about Ruth that she as a Moabite, he did not care that she was not from their tribe. He let her kept gathering the grain dropped by his workers, he even told them to “accidently” drop more so she could get more for their food. We often meet strangers in need wherever we go. But we hold back to help them becuase we can come up with lots of reasons to not open our car window to talk to them, or to stop a while at store. We are afraid to help strangers because there are many bad cases we heard. We are afraid to help them because we just not know them. But our God has blessed us with more for a purpose: to be a blessing to others. And I believe that the Holy Spirit will give us impression in our hearts which stangers who need helps and which ones not. I believe our God will use us to let others know that He cares for them and not to harm us. You and I always hear people say or write “God bless you” in every end of conversation we have with other Christians. We say or write it not because we are Christians, or to let them know that we are Christians, but there is powerful message in that phrase. When we say, “God bless you” to others, we let them know that God is with them and He blesses them with His blessings! We release God’s blessings into their lives. This not just some empty words that we say out loud. What would you feel in your spirit and heart when someone say it back to you? Would you believe that God will bless you? Or is it just a closing phrase? This truth I read from the passage of the Bible totally change my motive and intention of saying, “God bless you” to others. Let’s we say it with faith that God truly is with them and will bless them abundantly! Not only with words, but let us bless them with our deeds, so that they may see the goodness of God and experience the presence of the LORD All Might to meet their needs. And I pray that God will bless you all today! God sent the Judges to rule over His people when the time of darkness, when they did whatever they wanted because they did not have the leader that could lead them to live the life God had planned for them. They did not have the leader who lived in fear of the LORD. They did whatever they wanted because they did not know who God was, the one who set them free from the salvery. They did not see Him. They worship idols, not God. We need the godly leader who can lead us to the right path, to God. We need the godly and anointed leader who can lead us in worshiping the one true God. God sent Jesus his only Son, the one He anointed to live on earth, to show us the way to Himself. Through Jesus we can see God,we can know God, we can feel His presence. But we do not always set our eyes on Him. But we often take our own way. But we worship our own “idols” instead of He whom worthy of all worship and praise from us. That is why we need Jesus every moment in our lives. That is why we need Jesus to lead us. That is why we need Jesus to teach us to live godly life. With Jesus we can walk and live in this dark world. His word will be the light to the dark path we walk through every day. His word will be lamp to our feet and will ligth the right path to choose every day. This life is not easy to live. But with Jesus we have hope and receive grace to continue until the day we see Him face to face. He is my faith, joy, hope and in His holy name I pray. The first time I was brought before the judge, no one came with me. Everyone abandoned me. May it not be counted against them. But the Lord stood with me and gave me strength so that I might preach the Good News in its entirety for all the Gentiles to hear. And he rescued me from certain death. * Yes, and the Lord will deliver me from every evil attack and will bring me safely into his heavenly Kingdom. All glory to God forever and ever! Amen. The Word of God in 2 Timothy reminds me to keep on rely on the King of kings whom has anointed by the God himself to be with me, to lead me, to teach me, to rebuke me, to change my heart, to direct the course of my life, the core of my faith, the hope in living in obedience to Him and His calling in my life. Jesus himself reminds us at the End of the Day, this world will hate His followers, many will be sent to justice for what they do for Him, but worry not because though no one won’t be there with us, but He will. Scary? Yes. But we have hope. We have the King of kings stand with us. We have the One who have defeated death will stand with us. When I feel hopeless and weak, He is there to give me hope and strengthen me because He stand with me, holding me in His arms. I am not alone for the KING of kings, my LORD and SAVIOR is with me. Even others leave me, He is still with me. My prayer for your today that you will make Jesus the King in your life and follow him in obedience to His word. 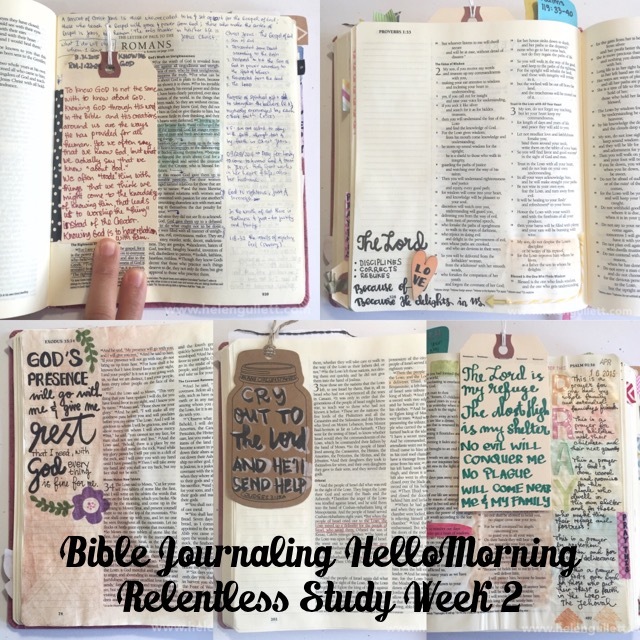 Today is the last day of the Relentless Study with HelloMornings. 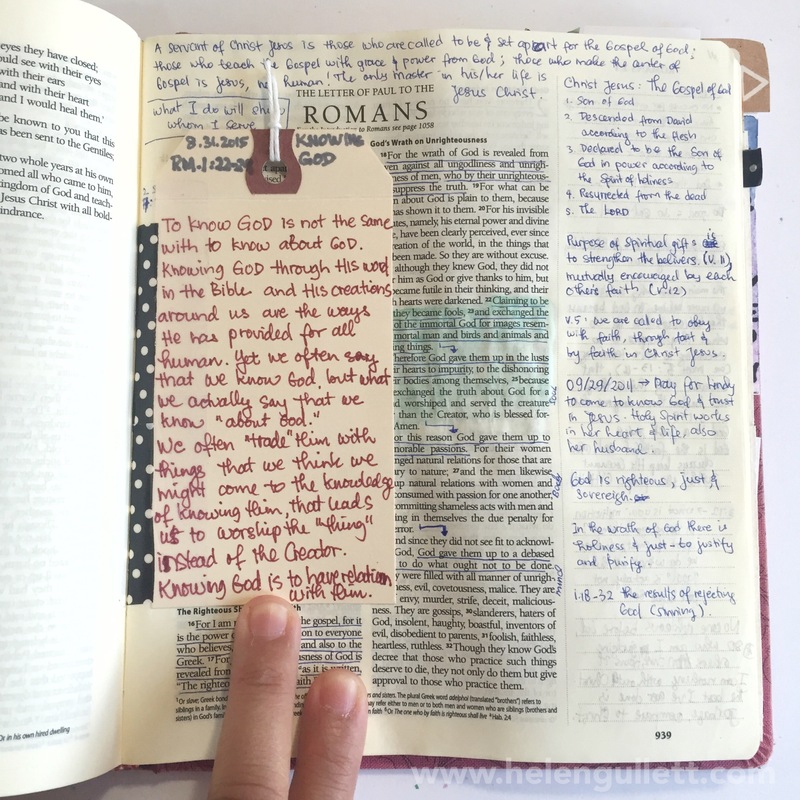 We studied the book of Judges together for 6 weeks. I joined one of the Facebook groups where I found my accountability friends. We encourage each other by sharing our thoughts on the reading of God’s word and pray to lift each other up to the Father. 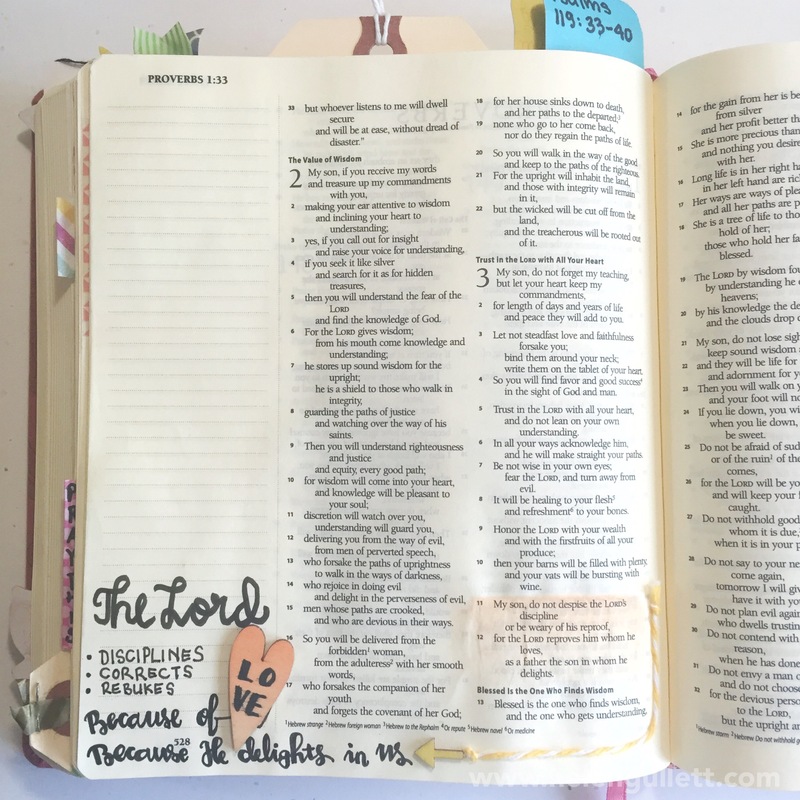 You can find more details on HelloMornings and their available groups, if you feel God leads you to join and find accountability that you need to walk in your faith. God has plans for each of us and He does not want us to walk alone in this faith journey. Blessings to you on this weekend! We made it through HelloMornings Study Week 2 study on the book of Judges. This week I learned who God is through how He revealed Himself to the people of Israel through the people He sent to save them. 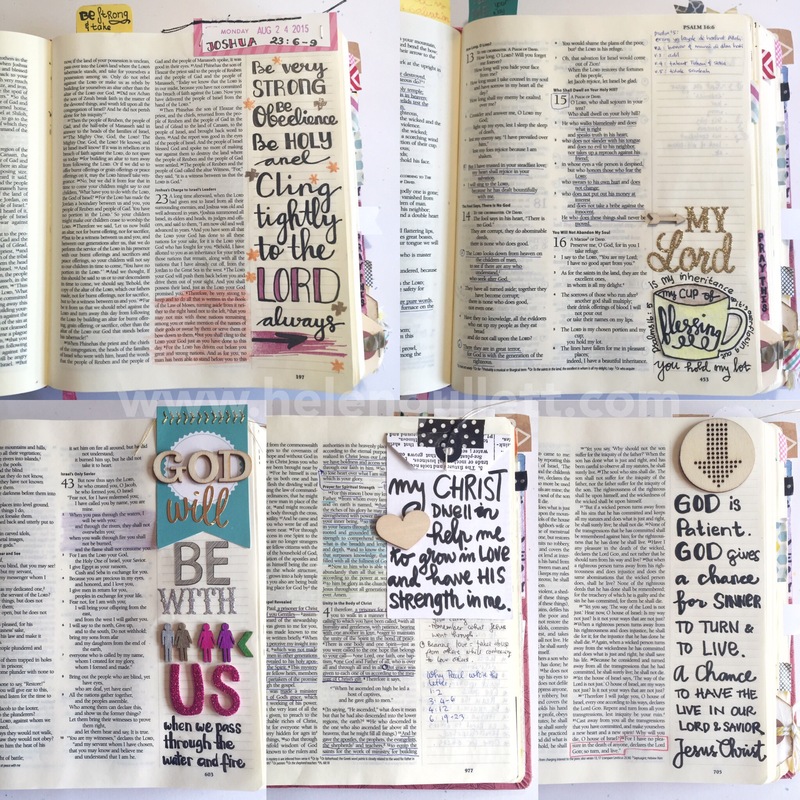 I studied God’s word together with a group of amazing ladies on one of HelloMornings Facebook groups. I join HelloMorning study since 3,5 years ago. And God has been teaching me to trust in Him completely in my walking with Him and He stretching my faith through circumstances we got through as family and personal life. I learned this week is that God wants us to know Him personally and not only know about Him. He reveals Himself clearly through all His creations around us. And He promises us to walk with us personally and be with us in any circumstances we go through, that He will give us the rest we need and everything will be fine for us. For He himself walk with us. Yes, there are circumstances we had gone through, or maybe we are now in the situation where we cannot see His presence or even not receiving the answeres to our prayers, know this well that God himself promise to us that He is with us. He is God. I am so thankful for what He taught me this week, thankful for the ways how He revealed Himself to me, and thankful the promises He gave to me. And I am looking forward to new things God will teach me and new revelations of who He is in the next week. I pray God reveals Himself to you also in ways that you can understand and gain knowledge of who He is so that you also can worship Him with all your heart, mind and strength. 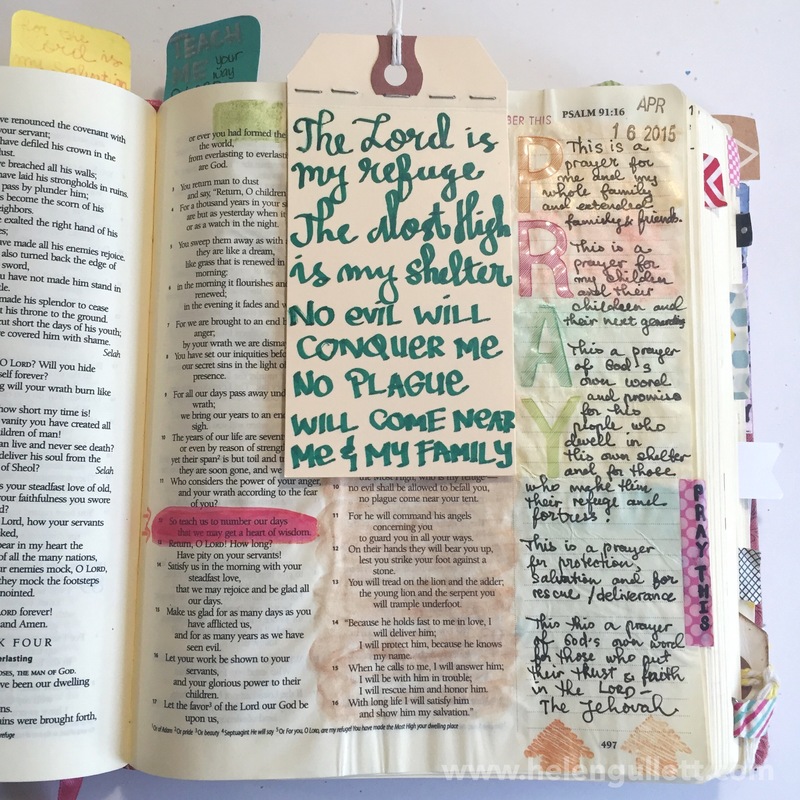 Exodus 33:14 | Supplies: ESV Journaling Bible, Pearlesscent Watercolor, Faber Castell PITT Artist Pens, CTMH Hello Life Scrapbooking Stamp Set, CTMH Ink Pads, CTMH Acrylix Block, CTMH Craft Heater, Wink Of Stella Clear Glitter Brush. I love the version from NLT says that God would go personally with Moses. 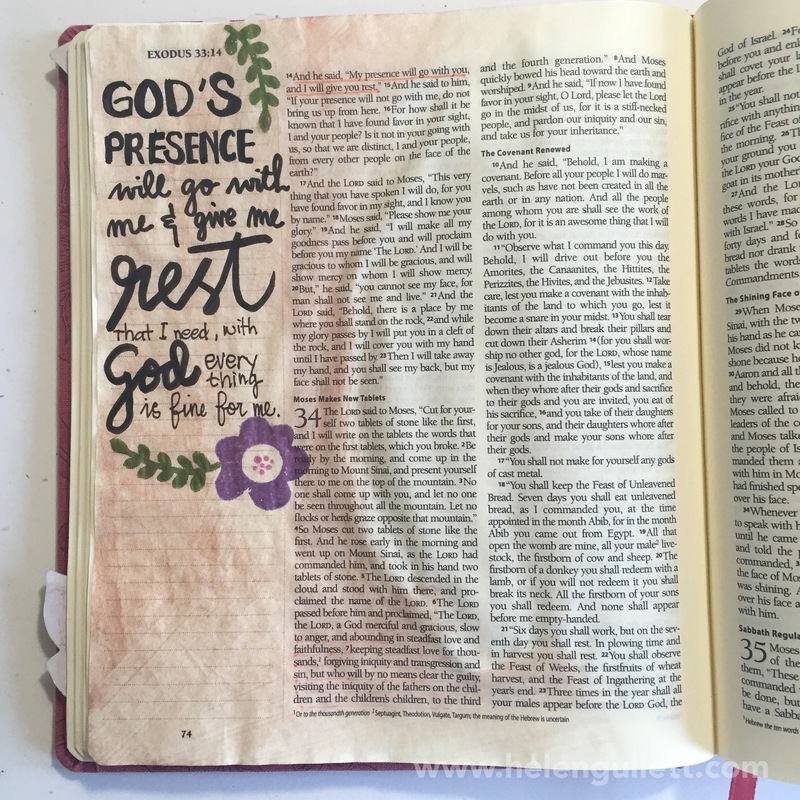 In the Study Bible, it explains that literally God was saying that would go with him face to face, Moses would continue experiencing God’s presence like he always did. And God’s promised to him to give him rest, a place to stay and in peace. But Moses dis not ask for God presence for himself only, he begged God to show Himself to the people of Israel too so that they also would experience His presence in the journey to the Promise Land. I learn today that to be in His presence all the time is the only way to gain true peace, knowing that with Him everything will be fine for us in our journey. He is with us personally in each step we have to make every day. That is not easy to do but we can pray and ask for His wisdom and understanding of Him and of what He’s doing in our lives in this season, we can pray asking for Him to reveal His presence to us all the time in every circumstance. His Holy Spirit does not only rest upon temporarily on us like he did to the judges but His Holy Spirit is dwelling in us forever since the beginning we follow and trust Jesus. His Holy Spirit will give us peace and rest we need at all time. All we need to do is ask without doubt, then God will give to us. I am thankful for the truth and encouragement I received from today’s reading of His word. May God bless you today and give you rest you need when you cling on him and abide in Him. God is merciful. That is the truth. It is also human nature and how easy we can see in the Bible how they went back to their old life style even though God had driven out them of their old land to live in the land God had promised to them. I see this happens to us too. To me. How easy I can feel discourage and disappointed when what I got from others was not what I expected from them. Or when I was stressful I easily yelled at my daughters who made mistakes instead of telling them gracefully. I went back to my “old habit” even I fought so hard to not to be like that. But God is strong enpugh to pick me up because He is merciful. It is because God is God, loving God, God of grace. This is why I need Him every single second, moment in my life to live to be a child, to be a wife, to be a mom and to be a friend to others. This is why though now I live in the new life in Jesus Christ, but my flesh is week. I need His power and desire to do what pleases My Heavenly Father’s heart every day. This is why He never stop showing us His mercy and grace repeatedly. Oh what a wonderful God! God bless your weekend friends! This is the Psalm of David. He sang to the LORD what was in his heart. He sang who God was for Him. He declared what God has done and what He would do for him and his people, Israel. This is the same song I sing this morning declaring the God is mine. He is my only inheritance. He is my cup of blessings. And only God who can fill my cup overflowing. I am so thankful for the study I have been doing with HelloMornings group since 3 years ago. The ladies at my group bless me. They are my accountability to overcome my weakness. He is working in everyone’s life to change them to be like him. And yes, He is working in my life for real through this group of ladies at HelloMornings. We just started our first week of six-week study in the book of Judges. If you are looking for accountability, group to study God’s word together and grow together, you can CLICK HERE to know more about HelloMornings and to register.